Are you looking for a nice place where you, your kids and family enjoy taking pictures this Christmas season. 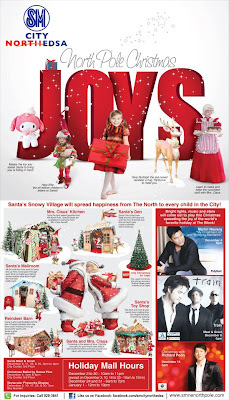 Experience North Pole Christmas at SM North Edsa, Sky Garden. At Sky garden, you can have your photos taken and enjoy the different activities inside Santa’s Den, Mrs. Claus’ Kitchen, Santa’s Mailroom, Toy Shop and Reindeer Barn. You can find the best gifts for your loved ones only at SM City North EDSA and have a striking pose with our gigantic and stunning Santa and Mrs.Claus. Surely you will be amazed with the “City Christmas” by LEGO. There is a giant Christmas tree and an awesome Holiday Village made entirely out of Lego at The Block Atrium. Enjoy the family bonding this holiday season. This entry was posted in Places and tagged Christmas at SM North Edsa, Experience North Pole Christmas at Sky Garden SM North Edsa. Bookmark the permalink.